A drop in outdoor temperature combined with room and car heating challenge your hydration. Cold tap water and fizzy drinks are not so appealing in cold weather especially if you are not dripping in perspiration as well. The end result? Under-hydration or worse still, dehydration. Under-hydration increases your risk of painful stones in the kidney and bladder, lack-lustre mental and physical fatigue, concentrated urine that irritates the bladder and increases the urge to pass small volumes of urine more often, a strong smell of urine that may linger in your undies, urinary tract infections, a build up of uric acid that triggers gout, and aged looking skin. If cold drinks don’t appeal, what other warm fluids will help keep you hydrated? What is it? Cut a fresh washed lime into four wedges. Boil the jug and pour boiled water into a mug. Lightly squeeze the lime wedge into the mug of water and then pop the wedge, skin and all, into the mug. Enjoy it hot but it’s equally nice when left to cool down a little. The lime wedge can be used for a couple of drinks - simply top up the mug with more boiled water. Both green and black leaf tea add to your fluid intake and help you hydrate. Too much black tea is not a great idea if you are prone to kidney stones or iron deficiency anaemia. Tea contains oxalates that are known to form kidney stone crystals. The verdict is still out on green tea with some experiments suggesting although oxalate crystals still grow, they are less stable and a different shape to the more common oxalate crystals. Tannins in tea bind iron so it is not available for your body. The tannins in tea may also stain the surface of tooth enamel. Be careful with some herbal teas as they actually cause you to pass more urine (are diuretic) and deplete your body of fluid. The old school of thought was that coffee is a diuretic and does not help with hydration but research has shown this not to be the case. Coffee can help you stay hydrated but I strongly recommend that you do not rely on coffee alone for hydration. 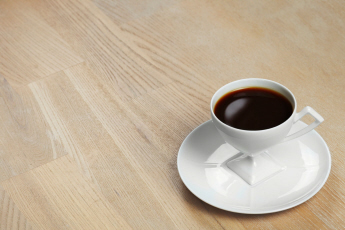 What’s the catch with drinking too much coffee? The caffeine content. Caffeine raises anxiety levels in both adults and children. The dose of caffeine that causes anxiety is surprisingly low - just 2 cups of percolated coffee per day (about 210 mg caffeine) for adults. For kids aged 5-12 years, the dose is much smaller, 3 mg caffeine per kilogram body weight per day, so 95 mg is too much. When you consider that a small 250 ml can of ‘energy drink’ contains 80 mg caffeine, you can see then both adults and kids can hit the ‘anxiety dose’ very quickly. Check out the caffeine content of some common drinks here. Milk is about 90 % water and adds to your fluid intake. Drinking more milk is great if you’re underweight or trying to gain weight. A glass of warm milk before bed with some malt powder (e.g. Horlicks) may even help you sleep better but unless you switch to skim or ‘no fat’, drinking more milk is not so smart when your goal is to shed body fat. Too much milk adds excess kJ (cals) to your day and your body. Best to include enough milk to meet your calcium needs but not use milk as your only source of fluid. Keep an eye on how often you have hot milk drinks as the weather cools down. This includes coffee made on milk, hot chocolate made on milk, chai tea, and sachets of flavoured coffee and chocolate made on water or milk. The small addition of one extra mug of flavoured coffee to each working day will sneak on over half a kilo (1.4 lb) body fat by the end of the winter (if your weight is currently stable) or slow down your continued weight loss success (if you are currently losing weight). Soups are based on water but depending on how they’re made, soups can make or break goals to achieve a healthy body. Let’s start with soups made on a broth that are clear. Think Asian style without the coconut milk. These are typically a broth or stock with sliced vegetables and a hint of shredded chicken or tofu bits. A few noodles may sit at the bottom. Clear soups are a great hydrater. Next in line are smooth vegetable soups which are essentially stock, seasoning and vegetables blended together after cooking. Think pumpkin, potato and leek, and parsnip soups. As long as these vegetable blends don’t have added cream, they are also a brilliant way to boost your water, vegetable and nutrient intake. Last on the list are creamy soups that have either a flour-butter roux to thicken them or have cheese, coconut milk, cream or sour cream added. Although these contain water and will help with hydration, creamy soups tend to be kilojoule heavy. Creamy soups help you gain weight and that makes them a poor choice when weight loss is your goal. When water is incorporated into a meal, such as soup or casserole, the meal satisfies hunger far more than having the same amount of water as a drink with the meal. That means a bowl of vegetable soup makes you feel fuller for longer than a plate of vegetables with a glass of water. Add a dollop of Greek style yoghurt in place of sour cream to blended vegetables soups such as pumpkin soup at serving time. This simple swap improves the nutritional quality - less saturated fat, more calcium and fewer kilojoules (calories). For a creamier soup, add skim evaporated milk and some cornflour in place of cream. Buttermilk in soups adds the flavour of sour cream without the saturated fat and excess kilojoules (calories).